This entry was posted on Monday, 28 September 2009 12:12 at 12:12	and is filed under Iraq's 2010 parliamentary election, Iraqi constitutional issues, Iraqi nationalism, Kirkuk and Disputed Territories. You can follow any responses to this entry through the RSS 2.0 feed. Both comments and pings are currently closed. WHY DO YOU CALL THEM NATIONALISTS? THEY ARE BATHYSTS AND ISLAMIC FUNDAMENTALISTS(SUNNI ORIENTED). DO YOU KNOW WHAT THE THE BATHYSTS HAVE DONE WITH THE RICH COUNTRY OF IRAQ IN THE LAST 30 YEARS? THEY ARE NOT NATIONALISTS, THEY WANT TO DESTROY ANYONE WHO IS NOT LIKE THEM. PLEASE LOOK AT HISTORY BEFORE CALLING SOMEONE NATIONALIST. Just to recap, the 22 July parties were the Sadrists, Fadila, some of the Daawa, some Shiite independents, Iraqiyya, Hiwar, Turkmens and parts of Tawafuq. Not sure how that makes them into a “Baathist” or “Sunni fundamentalist” alliance. Baathist: Parts of Iraqiyya, Parts of Turkmen(We all know what the Baathists have done in Iraq the last 30 years, sadly I don’t find that back on your articles. For you the history of Iraq begins in the year 2003, FOR ME NOT!!). It’s really sad that after so many years of studying Iraqi politics this is still NOT clear for you. Do you know what the plans of Sadrists/Fadila and Tawafuq are for the Iraqi society? (The Iranian revolution will be a picnic compared to their plans!!) Because I get the felling that you PREFER(!!!) those by you called “nationalists” above secular and democratic parties. I wish the best secular and democratic future for Norway, why don’t you wish the same for Iraq? SAD!!! You seem to be suggesting an Iraq with almost no people in it. Most Iraqis will tend to have some kind of past link with the Baathists or Islamist sympathies. Even the 2005 constitution says clearly that membership of the Baath in itself is not a crime. The Baath party also did many positive things for Iraq before it gradually became more and more narrowly based in the 1980s and 1990s, almost tribal in the end. Most of its worst excesses were committed in this period. Absolutely not. But I don’t think you can realistically seek to exclude those trends completely either, as you appeared to suggest in your initial post. I do agree with Reidar of “the Baathists” and the tyrant regime. Looking to the political history of Iraq in 1950 then should also band and not allowed Iraqi commonest party inside Iraq due to the crimes they done during Abdul Kareem Qassim in Mussil and other places? The problem inside Iraq now they can not forgot that Ba’ath was finished after the tyrant hold complete power in 1979, there was no party its was a militarized regimes hold the power not hesitating to kill any one (regardless) his tribe, religion, ethnics and believes, it was as one my friend call them gangsters control very rich bank. Let not forgot that ba’ath party 70% 0f his members are from south Iraq. Early 1980 during Iraq Iran war there was official party document circulated telling that most Shiite’s senior party members working more aggressive against the community than other party members! This taking us to new story about ibrahim al-ja’afari telling while he was student he worked “hard” with student union the tyrant issue special order request to be highbred in city centre hospital when all medical graduates required by law to serve one year in rural areas? Any way Iraqis if they like to be respected for their work this should translated how they can serve Iraq and Iraqi, so far there few but at most they failed. The Bath party did transform Iraq(from 1968 till 2003) in a big an beautiful PARADISE. Iraq is the BEST country in the world if you look at the standard of living of it’s people. THANK YOU SADDAM HUSSEIN AND THE BATH PARTY. please come back to power, WE MISS YOU!!! No one suggested or disagrees with you about the tyrant and his brutality against Iraqis all, but Not the “Tikrities” whom enjoyed liverish life under the regime time before and after 2003 billions handed to them to settle around the world enjoying the rest of their lives. Six years passed we saw tens of parties and individual’s who for so long keep crying for injustice by many old Iraqi regimes left Iraqis lived in misery despite all the resources & richness that land had witch far enough to cope with 50millions not 20 millions as today. Six years passed we saw few who worked for he Iraqis, most of them came to take their personal revenges from Iraqis not from the regimes gangsters who sill at large inside and out side. I would like to see those criminals who tortured and killed Iraqi in dentations centres all around Iraq in north south and other places be brought to jutes and get them pay their crimes as they helped the regime with their curl behaviours with their citizens. What we saw is same acts and same style of behaviours with most Iraqi till now so is it also here “Ba’athist” or they are from Badar, Sadarsits and other factions and parties. We got what they called themselves Islamist parties who trying to copy their handlers in Iran version of governing people, is that Iraqi what they needs now to see? Following a revulsion that made the life of other nation just as bad as many kingdom and sheikhs in the region. We have the chance here, we either move forward and stand up by choosing the right people to lead the nation or we keep hold ourselves prisoners of our old thoughts. وقضية خلطهم للأمرهذه تتوضح عندما تكتب عن الأدب في العراق السابق أو تتذكر لحظة جميلة عشتها في بغداد ، تبدأ الاقلام المسمومة بنعتك بأبشع الأوصاف لا لشيء إلا لأنك لم تتفق مع أفكارهم المريضة التي لاتريد للآخر أن يقرأ عن ساحة النصر وازدحامها عصر كل يوم ،أو عن شارع الرشيد وحركة الناس الطبيعية فيه ، أو باصات بغداد التي تتنقل بين أحيائها أو اغنية ما لفؤاد سالم تنطلق من محل لبيع الملابس في شارع النهر ، لايريدونك أن تكتب عن الجانب الآخر من الحياة ، يريدون فقط أن تكتب عن الطاغية وما فعله بالعراق وكأن لا حياة كانت هناك في زمنه ولا زواج ولا ولادات ولا وفيات ولا مدارس ولا أطفال ينجحون الى المتوسطة ، ولا علاقات حب في سن المراهقة البريء ،ولا أدب جيد كان يكتب بعيداً عن الأدب البعثي ولا حتى اغنيات جميلة لطالب القره غولي كنا نتداولها في جلساتنا ، يريدون أن ننكر كل ذلك ونكتب عن السوداوية التي في عقولهم ، وإن لم تكتب فالإتهام جاهز لك ،عدو الإنسانية أو مناهض لـ ( الثورية) . الدولة العراقية سقطت برمّتها في عام 2003 ، والطاغية سقط أيضاً وأُعدِم ، والعصر التكريتي الدموي إنتهى الى غير رجعة وأصبح تاريخاً محكياً ومكتوباً من وجهات نظر عدة، متى يا ترى سينفض التورابوراويون الغبار الاسود من على أدمغتهم وينظروا الى المستقبل ليصنعوا فِكرة ؟ . Yes Salah, I agree with you, we need secular democratic non-Bathist politicians, like Jalal Talabani. I am still waiting for you comment on this Mr. Visser. Ari, to many Iraqis south of Kurdistan, your ”secularist” Talabani is pursuing primitive policies of ethno-nationalist expansion aimed at the destruction of governing capacity in Baghdad whilst turning a blind eye to rampant corruption and tribalism in Kurdistan. Iran seems to be quite pleased at the net outcome. I concede that Barzani is worse on all of the above variables. It seems that the Maliki=horns-and-tail meme has run its course so perhaps we should not be surprised that a Talabani=source-of-all-evil is taking its place in the blogospere. For the record, both the major Iraqi Kurdish parties, the KDP and the PUK have long been affiliated with the Socialist International. On the spectrum, their origins are from the secular Left and today they are democratic socialists. Which should be very familiar to any northern European. The anti-Kurd bias in Visser’s reporting is deeply troubling as well as counterproductive. Strong opposition to Kurdish national aspirations will undoubtedly strengthen hardliners in Kurdistan such as Masoud Barzani. No doubt the ruling parties in Kurdistan are deeply flawed, but the emergence of Nawshirwan Mustafas Gorran-list proves that Kurdistan may still emerge as a genuine mulitparty democracy. However I remain mystified on one central point in Mr Vissers argument: if the goal is to do away with secterianism and election quotas, why not allow also Kirkukis to vote as individuals without a quota-system? Jan, there’s nothing anti-Kurdish about my writings, I’m just criticising the megalomaniac tendencies of the policies of the PUK and the KDP and the way they destroy the political climate in Iraq. We used to criticise this kind of extreme ethno-nationalism on the Balkans in the 1990s, so why not criticise it in Iraq today? I find it really difficult to understand how people who claim to be progressive and who know anything about history can justify the Kurdish position on Kirkuk for example. There is no contradiction between making these criticisms and acknowledging that the Kurds have suffered terribly in the past. As for quotas, I am certainly not advocating them. The main point is that there is not a level field in Kirkuk right now and Iraqis are right to protest this one way or another. BB, many strange parties have affiliations with the Socialist International, let’s look at specific policies instead. Talabani is old, he already said he will retire and many people believe he should, and he did not make good example of a secular politician, that doesn’t make him center of the blogosphere or =source-of-all-evil, you have twisted logic. BTW where do you stand regarding including Baathists in the political process, are you with exclusion or inclusion? Thanks for your reply, Reidar. you are obviously not including Kurds in your definition of Iraqi public opinion. And let us leave the question of who is or is not progressive out of it. Most of my research on Iraq covers the 1920s when Kirkuk was dominated by Turkmens (as was Arbil, although the process of Kurdification was much more advanced there). To the extent that Kurdish movements in the north appear at all in the sources (if I remember correctly this was mainly around Sulaymaniyya; Dahuk was far more docile and backwards back then), it is largely perceived by the British as a collection of tribal uprisings, although I am aware that historians have detected Kurdish proto-nationalism at this point. But the main argument I would like to make is that the idea of annexing Kirkuk to a Kurdish entity is far more recent, and above all the product of the ideas of one man in the 1960s, Mustafa Barzani. I am questioning whether perhaps the Kurdish people are doing themselves great disservice by focusing so strongly on Kirkuk when they have great possibilities for having a prosperous, self-governing federal region within the area that is already recognised by the other Iraqis as theirs. Indeed, a compromise with a special status for Kirkuk city would be a better solution than adding the whole province to the Kurdish entity. However I see no Kurds willing to be that flexible – not even Nawshirwan. Still, if the Arab side(s) would show flexibility on the whole issue of disputed areas, they might also be met with movement on the status of Kirkuk from Kurdish politicians. There is an obvious solution to the Kirkuk issue for the 2010 elections, that is, the election in the province be placed under the control of the UN run International Mission for Iraqi Elections which oversaw the 2005 elections and constitutional vote. However, since the results would almost certain demonstrate yet again the clear Kurdish majority in the province that was shown three times in 2005, it is unlikely that July 22 and its blogosphere fans would agree to this straightforward solution! It is their awareness of the substantial Kurdish majority that has forced July 22 to demand Lebanon-style quotas in the province, so the last thing they want is an election or even a new census. Faisal Kadri: Am not sure my opinion from Australia on this issue is worth anything, but from my reading the Baath Party was a secular, nationalist, modernising “socialist” movement. But unlike the Iraqi Kurdish parties whose socialism was from the Left, the Baath followed the German nationalism socialism model of the 1920s and 30s. Which probably explains why it was vulnerable to takeover by Salah’s Tyrant and his Tikriti clan. All this by way of explanation as to why I believe “Baathists” should certainly be included in the new democratic process. The Party itself has been banned (I think in the constitution? )but in my view this frees up previous members from the taint of the Saddam era to develop a political agenda incorporating their secular, modernising, nationalist goals within the new democratic framework. Essential to the maturation of the Iraqi state politics in the 21st century, in my view. BB, what the other communities are concerned about are demographic changes in the 2003-2009 period, manipulation of voter registers etc – the sort of thing that isn’t addressed by observations of the elections themselves. At any rate, if you read the report you link to closely you will see that the IMIE mostly had the role of a pundit; it had limited staff, no powers and could only recommend and comment. It was the Iraqi electoral commission that basically ran the elections. Salah’s Tyrant and his Tikriti clan. It’s more appropriate to call him Aussie’s loved Tyrant and his Tikriti clan. Reidar, you claim that the whole question of Kirkuk was constructed by old man Barzani. Many observers agree that it was under the leadership of Mustafa Barzani that the Kurdish movement delveloped a national perspective, as opposed to tribal perspective(s). However Kirkuk was part of the Ottoman vilayat of Mosul which (except for the city of Mosul itself) was claimed for Kurdish selfrule by the Barzani-movement since the 1930s. The Kurdish urban movement was centered in Suleimaniyah, but the tribally based Barzani-movement was centered in Badinan. The friction between these tendencies define the Kurdish movement in Iraq to this day,as witness regional elections in July. But Kirkuk has also been a center of Kurdish consciousness, and Edmund Ghraeeb writes (The Kurdish Question in Iraq – 1981, p 29) : In a referendum, the Iraqi people voted for Faisal to be king of Iraq, although the two provinces inhabited mainly by the Kurds were opposed, in Kirkuk the majority of the population voted against Faisal, and in Sulaymaniyya the election was boycotted”. This indicates that Kirkuk had a Kurdish majority in 1921, and that there at this time was a general feeling of separate identity from the Arab provinces. Jan, a couple of quick observations on this, written on the basis of what I can recall from files that I have worked with earlier. Firstly, remember that the Mosul vilayet in its 1914 incarnation had existed only a few decades; before that it was sometimes part of the Baghdad vilayet, and at times existed separately but in a much smaller area without Kirkuk. Kirkuk, for its part, oscillated between sometimes being a part of the Baghdad vilayet and sometimes forming a vilayet of its own (Shahrizor). But even more importantly, no one is disputing the dominant Kurdish role in the countryside of Kirkuk, it is Kirkuk the city we are talking about. All the key British observers from the 1920s define Kirkuk as a Turkmen-dominated city; indeed some saw Arbil too as a Turkmen centre, but noted that in contrast to Kirkuk it was undergoing Kurdification. There is more about this at http://historiae.org/disputed.asp; you can also check the League of Nations reports on the Mosul vilayet from 1924-25, describing the town as overwhelmingly Turkish in culture. Also, if I remember correctly, the 1921 opposition to Faysal was caused by the combined resistance of Kurds in the rural areas and Turkmens in the town, who remained pro-Ottoman and later Kemalist for a few years before converting to Iraqi nationalism. Finally, as you probably know, the Kurds are unwilling to use the 1957 census as a basis for discussion of the status of the city itself because it shows that the Turkmens were still the biggest group at that point. the Baath followed the German nationalism socialism model of the 1920s and 30s. bb, are you suggesting the Baath like Nazi? 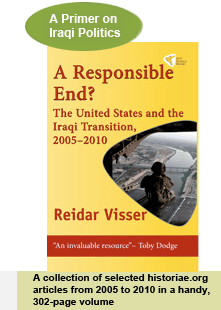 Reidar, under the constitution are they allowed to do so, while 1957 used by Iraqi governments in may occlusions? Salah, the old censuses have no role under the constitution, the relevant clauses of the Transitional Administrative Law, confirmed under the constitution, call for the holding of a new one. A law was passed last year for a census to be hold this year but it has been put on hold until October 2010.
he artillery bombardment, which took place late on Thursday night, hit several villages near the towns of Sidcan and Zarawa on the edges of Arbil province on the Iraqi-Iranian border, said the website of the Patriotic Union of Kurdistan (PUK), a Kurdish party headed by the Iraqi President Jalal Talabani. The Iranian shelling left no human casualty but caused material damages, including the killing of scores of livestock, the website said, citing a Kurdish security source. Also on late Thursday, the Iranian artillery pounded several more villages in the area of Qandil Mountain in Sulaimaniyah province, the source said. Authorities in the Iraqi Kurdish region frequently accused Iran of shelling bordering areas with artillery rounds as part of its fighting against the Kurdish guerrillas of Party for a Free Life in Kurdistan (PEJAK), who took up arms for self-rule in the country’s Kurdistan province in northwest. Iran accuses the PEJAK rebels of using the Kurdish areas in northern Iraq as a safe haven and a launch pad for their attacks against Iranian government. No Salah, wasn’t referring to the National Socialist German Workers Party (Nazi)but to “national socialism” as a political movement that came to the fore in Germany, Italy and Britain in the 20s and 30s. My point was the Baath followed this model as opposed to the marxist/communist model of the time.ie, on the spectrum the Baath were of the right, not the left. Both movements of course were based on one-party states, which meant they were both susceptible to takeover by the extremes and the corruption of totalitarian rule. speak or read Arabic, and the officials arbitrarily filled in the forms on their behalf. Also I found this to be very informative as to the history of Kirkuk. No one is disputing the Kurdish influence in large parts of the countryside, we are talking about the town. On that issue, I would rather trust Soane’s observations from the 1920s in the second source you link to instead of the quite strained argument presented by N. Talabany (note the author’s name) in 1999. Also note that the only source for the alleged Arabisation between 1930 and 1970 in the second source (introduction) is the very same Talabany! In the more detailed narrative later on there is just one big lacuna for the entire monarchy period and the 1960s. All in all, I have yet to see a convincing argument that Kirkuk had any predominant Kurdish character historically. And I have seen a big number of attempts, trust me! You seem to take sides here by simply discounting N. Talabany presumably because of his name. You offer no other reason. You stated the Kurds are unwilling to use the 1957 census as a basis for discussion of the status of the city itself because it shows that the Turkmens were still the biggest group at that point. Yet its clear that it is because of the fruad commited during the census. Kirkuk and the surrounding area is or has had a Kurdish majority at times past and present. and the main officers live. The barracks are situated next door the palace. whom three quarters are Kurds. Also the arabisation is clear, it Isnt alleged. How else can you explain this. the same period from 48.3% to 37.53%. This is getting slightly repetitive. I feel that we are back at the same question: Why is it so hard to find a piece of non-Kurdish scholarship that backs up the argument you are making? I just wonder how you can let a single nineteenth-century traveller override the collective interpretation of all leading officials of the British-mandate as well as nineteenth-century travellers like JS Buckingham and Claudius Rich (who both claimed that the town was dominated by Turkmens and Turkmen culture; Shiel, mentioned in your source, had a similar impression.) I don’t mean to get essentialist over the racial aspect here: Of course there were lots of inter-marriages and cultural exchanges. What I find more important is that the sources tend to characterise the area in terms of its Turkish culture and above all its links with Baghdad and the plains. Kurdistan was mostly seen as the mountainous country further north. I suggest you read David McDowall’s History of the Kurds. Although the author is pro-Kurdish he sees no point in taking the idea of a Kurdish Kirkuk at face value and describes it as an impromptu negotiation demand by Barzani in the late 1960s. As for Arabisation, please read my comment once more. I did not deny Arabisation post 1970. I have never denied that. I said the evidence for Arabisation in the period 1930-1970 was lacking. There is none in your comment either, which relates to the situation in the late 1970s. No one is contesting the fact that there was Arabisation in the 1970s. I am happy to keep this thread open but only if new credible pieces of evidence are presented. Also, I am afraid I simply don’t have enough time to reply to straw-man attacks like the last one you made about Arabisation. Checking out what David McDowall actually says, I find your rephrasing highly inaccurate, Reidar. In my edition (reprint 2005) he describes (p. 156 ff) how Sheikh Mahmoud Barzinji claims Kirkuk for the Kurds in the 1920s. Mulla Mustafas claim vs Saddam Hussein to Kirkuk and other areas (pp 314 ff) in the 1960s come out as a continuation of Barzinjis earlier claims. Sorry for being repetitive but here is another. It should explain why people find it difficult to find a piece of non- kurdish lit. It would seem natural that Kirkuk, after long being controlled by the Ottoman Turks, should appear that way but as you can see from below the Kurds were there just integrated into Turkish culture at the time. their origins were Kurdish, nevertheless considered themselves to be such. Eastern Iraq 1919-1925, (London: Oxford University Press, 1957), 264-267. Jan, sorry for the delay. It is good to get the opportunity to dust off McDowall’s book! I rely on the 1996 edition. First, lest anyone cries foul, McDowall is fundamentally sympathetic to the Kurdish cause, as the prefaces to the book explain in great detail. Hence his observations on the Kirkuk issue will hopefully have a greater chance of resonating with pro-Kurdish readers than those from other sources. “[Mark Sykes] preferred … an autonomous Kurdistan excluding Kirkuk, Altun Kupru and Arbil where the largest urban communities were Turkoman”. “the notables of Kirkuk apparently ‘felt that the path of progress lies in the direction of Baghdad, not in that of Sulaymaniyya. Moreover there is no trace of Kurdish national feeling in Kirkuk”. “Despite the relatively recent arrival of most of the Kurds in Kirkuk town and its oilfields, the KDP felt passionately that it should be included in the autonomous area”. I am unable to find any explicit reference to the effect that Mulla Mustafa’s claim to Kirkuk “came out as a continuation” of the Shaykh Mahmud uprising. I also had trouble finding an unequivocal reference indicating that the town itself was a central aspect of Mahmud’s pretensions (note that Kirkuk was also a province or liwa and sometimes you must see from the context whether the reference is to the town or the province), although he was certainly feared by the local inhabitants. It is possible that Shaykh Mahmud may have claimed paramountcy over some rural tribes around Kirkuk. At any rate, and this must be the significant point in our discussion, as the above quotations attest to it seems clear that the population there had no interest in his adventures, whatever their exact territorial scope. Rereading McDowall is always useful, the amount of information he has collected and sifted thorugh is simply amazing. The point where i found you misrepresenting him was however not about the population of Kirkuk, but about how Kirkuk came to be such a central part of the Kurdish agenda. … he sees no point in taking the idea of a Kurdish Kirkuk at face value and describes it as an impromptu negotiation demand by Barzani in the late 1960s. I have not found such a statement in McDowalls book, to the contrary I found him referring to Barzinji’s claims on Kirkuk forty years earlier than the negotiations beteween Mustafa Barzani and Saddam Hussein.